So, a little burned out from work and general NYC living, MW and I decided to take advantage of Continental's ultra-cheap web fares and fly to Montreal for the weekend. Our main goals? To relax, to eat, and to shop. Montreal is a fun city in which to do all three--Canadians are definitely laid-back and friendly, and the city reminded me of a cross between Chicago and [insert any European city here]. Since we were only there for about two full days, we didn't get to see a ton of the city, but here are my impressions. Rue St. Catherine is kind of the main drag of Montreal's city center; our hotel was a block off of it. The street is home to many department and chain stores--many familiar ones, like the Gap and Canadian export Aldo--and, by night, lots of strip clubs (Montreal is a popular bachelor and bachelorette party destination--who knew?). 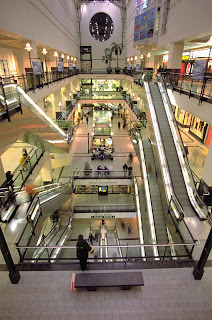 The fun part is that there are all of these indoor malls along the street, and you can walk from one to another underground if you so choose (a smart thing to do in the winter). I was happy to see Mango, which I feel is now in every North American city except NYC. Local to Canada, however, is Jacob, a Club Monaco-esque chain featuring streamlined basics and work-friendly looks. I really loved Bedo, however--it carries a lot of glam, club-friendly clothing but also suits and other more practical things. It reminded me a lot of Zara (which is a bit farther down the street). For more upscale shopping, Ogilvy is a big Neiman Marcus-esque department store, and further up the street is Canada's famed Holt Renfrew, a more fashion-forward, Barneys-esque store (think Chloe, Balenciaga, etc.). They were having quite a sale when I was there, but unfortunately the American dollar is quite weak, so I refrained. North of Sherbrooke Street, Rue St. Denis and Rue St. Laurent are a less touristy, more boutiquey shopping stretch. There are a lot of vintage clothing stores on these two streets (Canadiennes call vintage "fripperie"); I loved the one on St. Denis near Sherbrooke (the name is escaping me right now), and Mount Royal Friperie was also quite good, and a bit more affordable. The other stores I liked were Lola & Emily, a boutique that felt like a home and had totally cute stuff; MO851, a store with luxe but affordable sleek leather bags and coordinating clothing; U&I, a pricey but well-edited clothing store with APC, Anglomania, and the like; and Bella Pella, a Lush-like store with homemade skincare and bath products, where I dropped a lot of Canadian dollars on soap (I love handmade soap). 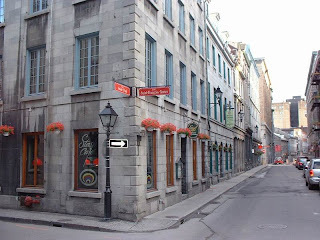 One of my favorite parts of Montreal was the touristy old city--like I said before, it's a lot like the old part of any European city. MW and I were there in the late afternoon on Sunday so many of the shops were closed, but there appeared to be a lot of chic boutiques on Rue St. Paul (the tourist shops are on Rue Notre Dame). Unfortunately, we didn't make it to Westmount, which is supposed to be super-chic. Oh well, maybe next time, eh? Thank you so much for this guide! Hug to you.